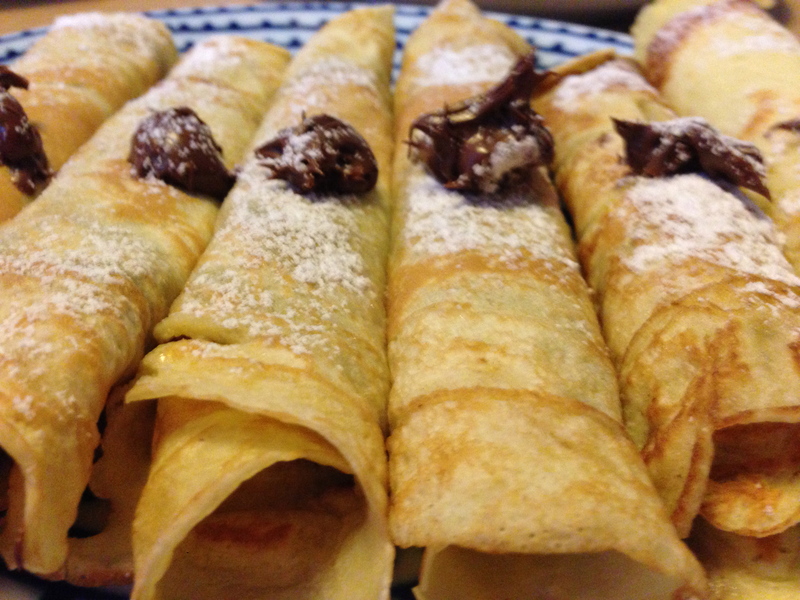 Close-up of our Nutella crepes; photo by Micah. Some of you may be tired of reading about Italian soccer, and some of you may be wondering what we have been cooking and eating recently. Today was a particularly good food day; so here is a quick update. Some weeks ago we discovered that the Italian version of baking soda makes excellent pancakes. They have become our regular Sunday morning treat (and the kids have come to like Nutella as a topping). This morning Simon had an early morning soccer game (you will have to ask him about the details), and while he and Pedar were at the field, Micah, Jakob, and I decided to rework our pancake recipe into a crepe recipe (basically more eggs and milk). We were pretty happy with the results. Jakob created this plate of Nutella crepes. We filled the rest with frutti di bosco jam.